As B2B marketers dive into 2016, which digital tactics should they be devoting additional budget to? What are the best approaches to focus on? Overall, digital is expected to become an even more essential part of B2B organizations’ marketing plans this year. Some 98% of B2B companies increased their digital spend last year, and that number is expected to be matched in 2016. Marketers are already spreading their digital budgets across a wide range of channels, including websites, search, social media, Big Data, content creation, app development, software suites, and much more. So, which of these many areas deserve additional consideration in 2016? We’ve sorted through dozens of surveys and research reports to find the key digital approaches that are both already working for B2B marketers and that have substantial future growth potential. The new e-book from MDG Advertising, “B2B Marketing 2016: 5 Digital Must-Dos,” explores the key tactics and tools that are increasingly important for B2B organizations in almost every vertical. The complimentary e-book examines why each of the areas matters, and what you’ll need to do to make the most of these opportunities. Predictive analytics: Many B2B companies say they are investing heavily in marketing analytics in 2016; explore how new tools are giving marketers a powerful crystal ball. Check out the full e-book for in-depth analysis on why each of these areas is expected to be important in 2016, and for specific recommendations on how to make the most of their potential. 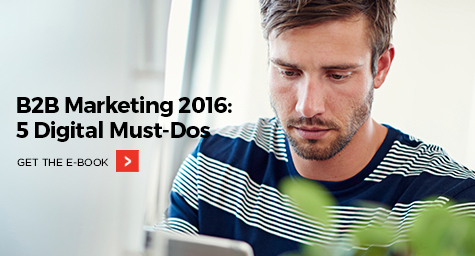 Learn why B2B marketing won’t be business as usual in 2016. If you’re part of a B2B company that plans to devote more dollars to digital in 2016, you’re in good company. Some 98% of B2B companies plan to increase their investment in digital for the coming year. The question is, what areas deserve the lion’s share of your budget? MDG’s complimentary new e-book narrows it down to which tools and tactics are likely to generate the greatest results. Discover the latest tactics in B2B marketing. Contact MDG Advertising today at 561-338-7797.